Dukkah! Have you ever heard of it? It’s a spice blend of toasted nuts and seeds. It’s quite easy to make yourself. Mix all dukkah ingredients together, roast in a pan for approx. 10 minutes (the smell is amazing). Combine all ingredients in a food processor and pulse. Cut the avocado, remove the pit out and peel the skin. Trim the bottom ends off the asparagus and use a vegetable peeler to shave them into long, thin ribbons. 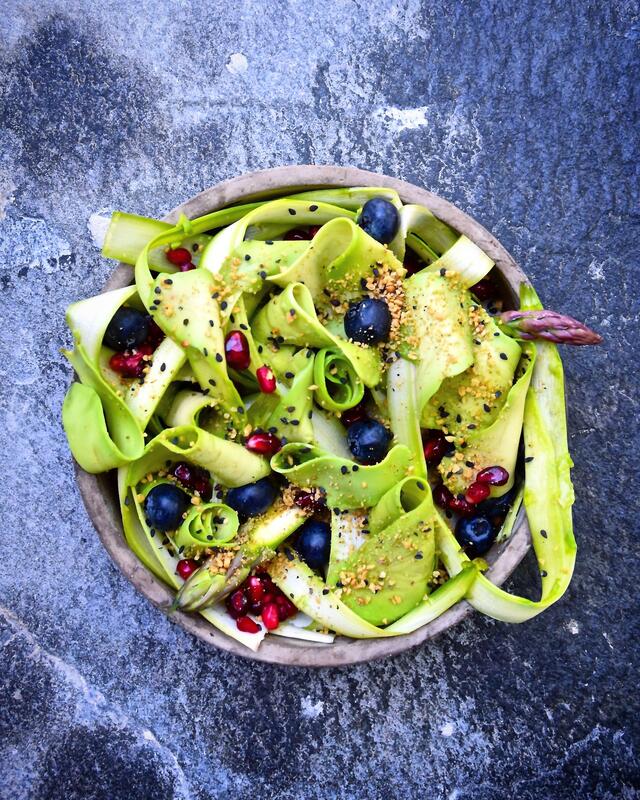 Transfer to a medium bowl and add sushi vinegar, olive oil, lime zest, pomegranate and blueberries. Divide the salad in four bowls and add shaved avocado. Sprinkle with dukkuh and a little extra black sesame seeds.